The Travel Berkey water filter is smaller than the Big Berkey, is designed for everyday use and is ideal in situations where a reliable supply of treated drinking water becomes unavailable. This elegant system is constructed of high grade, polished stainless steel, making it hygienic, durable, and easy to clean. The upper chamber of the two piece housing is filled with water which gravity feeds through the filters into the lower chamber. Each set of two (2) elements will remove harmful pathogenic bacteria such as E-coli, Cholera Salmonella Typhi, Giardia and Cryptosporidium. The filters remove and reduce unwanted chemicals such as Chlorine, lead, rust, sediment, pesticides, herbicides, organic solvents, VOC’s, SOC’s, Trihalomethanes and foul tastes and odors. 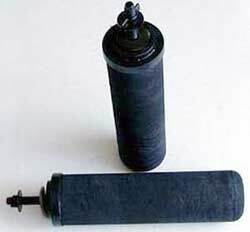 The durable and efficient Black Berkey filtering elements can be cleaned and re-cleaned (up to 100 times or more) as needed with a soft brush or Scotch-Brite pad. The Travel Berkey is far superior to other filters because it removes harmful pathogenic bacteria. Its unique filtering system reduces unhealthy organic chemical contaminates and impurities while leaving in the beneficial minerals your body needs from water. It’s simply the most healthful, clean, and delicious water available. 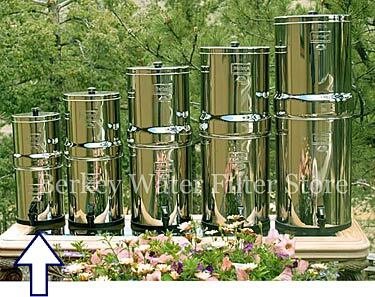 Berkey filters assemble in minutes without tools, electricity, water pressure, or plumbing. What’s more, they are simple to operate, understand, and maintain. The Travel Berkey wter filteris easily the most economical water filtration system you can own. Its unique design allows you to easily remove and clean the ceramic filters over and over again. The powerful Travel Berkey easily cleans ordinary tap water, yet it is so powerful, it effectively handles even raw, untreated water from lakes and streams. What’s more, the Berkey is the ideal water filtration system to have on hand in the event of an emergency or natural disaster such as blackouts, hurricanes, floods and earthquakes, when tap water is not available. The Berkey is so convenient and easy to use, you can take it with you anywhere: a vacation, hunting & camping trips, college dorms, and use it in your RV or boat. The Berkey is made of durable, high-grade polished stainless steel. Its attractive, high quality design makes it a beautiful addition to your kitchen and home. The Travel Berkey Water Filter’s high quality and effectiveness has stood the test of time. First ordered by the Royal House in England, it’s also been used by relief organizations such as Unicef, the Peace Corps, and Red Cross Societies internationally. What’s more, British Berkefeld systems have been used for over 150 years by missionaries, explorers, and relief workers in over 140 countries around the world.